Inder Loves Folk Art: Sewing for Joe. I have been sewing up a storm lately, and I'm lagging behind blogging everything! Next up is a very quick but very satisfying sew for Joe. 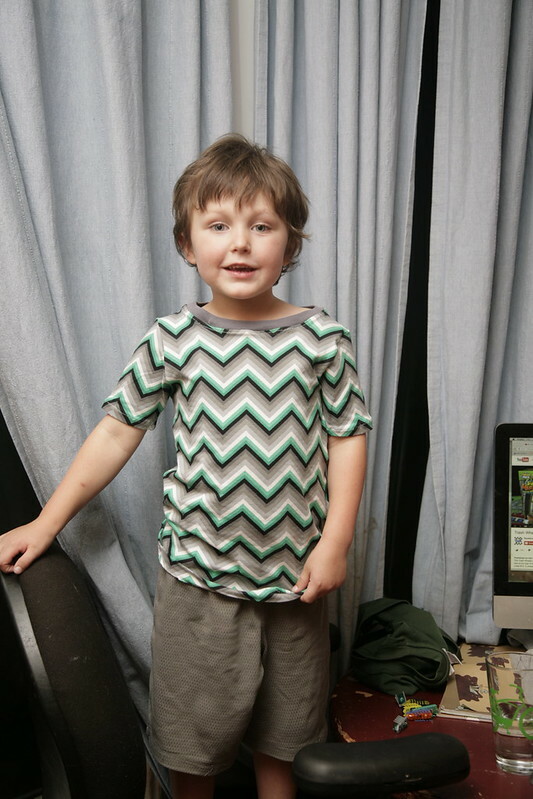 A few weeks ago, I was shopping for knit ribbings on Fabric.com (the selection at my local fabric stores is terrible) while Joe was watching a YouTube show about Hot Wheels or whatever when this chevron-printed Kaufman Laguna jersey knit caught his eye. The attraction was immediate. "Mama! Click on that! What's that?" So I clicked on it. Joe stared with awe. "Can you make me a shirt with that? Make me a shirt with that! I like it!" Well, it's not something I would have picked (I'm not really into chevrons, I admit), but I love sewing for Joe, and he's really picky about what he will wear, so of course I said yes and bought a couple yards. Then it took forever to arrive. Man, that free shipping sure ain't quick. When it finally arrived, on a weeknight, I opened it up and showed it to Joe. "Can you make a shirt? RIGHT NOW?" So I threw it in the wash and made him a shirt. It's the Flashback Skinny Tee, of course, in a size 5T with extra length. I didn't bother to match the print or anything (chevrons seem near impossible to match anyway). It's pretty disco-fabulous, right? And Joe liked it so much he insisted on wearing it to school the next day. I used some lovely organic charcoal ribbing from the same order for the neckband. It turned out too loose - my mistake, the ribbing is very soft and doesn't have much recovery. But Joe says he likes it that way, and he does tend to stretch out his neckbands terribly anyway, so I'm leaving it be. I must say, I really like the quality of the Kaufman Laguna jersey. Very nice. It has some lycra content and it feels very sturdy and stable, but with a good amount of stretch too. I would recommend trying it! The next night, I asked Joe if he wore his shirt, and did he like it? "Yes! Can you make me shorts? RIGHT NOW? To wear to school tomorrow?" I know, I know. I'm setting him up with terribly unrealistic expectations about my sewing abilities. But it's so rare that Joe asks me to make him anything! When he gets excited about a project I tend to jump right on it, in hopes that I can change his mind about wearing mama-mades more often. Talk about not matching chevrons. Ouch. To be honest, these shorts kinda hurt my eyes. But he likes them, and that's the main thing. I used the free Oliver + s Sunny Days Shorts pattern as a starting point for these dead simple knit shorts, but I serged the waistband in one go and then threaded the elastic more like the Nature Walk pants. No pockets, no nothing. Beyond easy. I am looking forward to making some Sunny Day Shorts according to the actual instructions at some point, but for this quick 'n dirty operation, the pattern pieces were just fine. I am making a mental note that the length on the Sunny Day shorts is a bit shorter than I usually like with Joe, but it didn't matter here, as I just did a narrow zig-zagged hem. 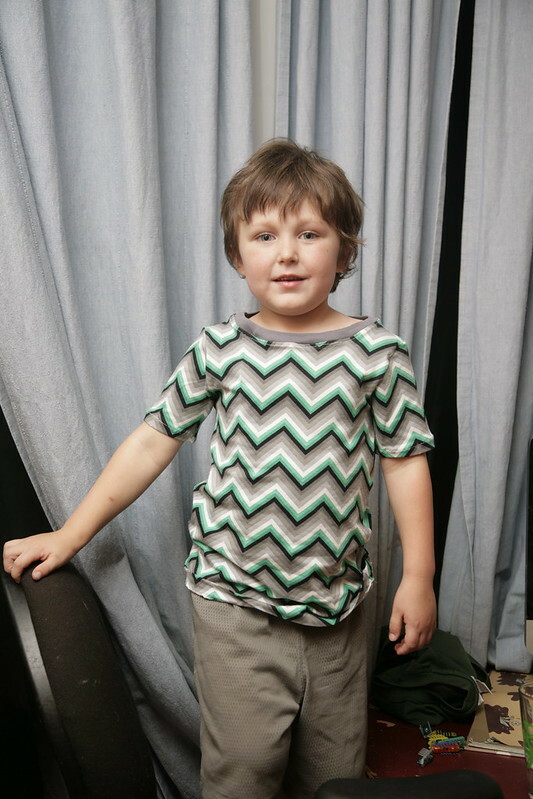 I totally understand your aversion to chevrons, both from the aesthetic aspect and the matching difficulties, but when kids love their clothes then there's nothing not to love! Well done. Both together would make a great pair of summer PJs! Inder, this post was so much fun to read. For one, I am so thrilled about Joe's enthusiasm for mama-mades. That's so awesome! And I had to also smile and nod about your chevron comment. For awhile I thought I was the only person in the sewing blog world not into chevrons. I wondered if I was just a "late adapter" ;) but I think it's a craze I'll never take to. That said, I do think this shirt is very cute and 70s. So when you said disco, I thought - exactly! It's so cute on him! And I love his hair! He looks like Jude at that age! Iris sticks out her tongue just like Maggie in that photo. Just an all-around happy and fun to read post. That is what we do (if possible), wait until it is party dresses for last minute invites. They are both fab and as above, summer pj's will be perfect when they no longer pass for 'out'. Thank you Nicole!! I love sewing for Joe! I just wish he liked the things I make a bit more. Right now he has an aversion to pants, and all things made with woven fabric. But he does wear the t-shirts I make him all the time, so I guess I should just keep on making those - they are so easy and fast, after all! Hopefully he'll come back round to woven pants eventually. I wondered when I saw the title whether this would be a good or bad sewing-for-Joe experience! So glad it was good and driven by him! Funny about the chevron-aversion and others' comments above. We actually have no chevrons in our shop due to a bit of aversion, I mean, they're not awful but yeah, a bit eye-hurty! However, Joe chose well. Yay! Haha! Yes, I didn't mean to create suspense with the title! There is always some suspense when I sew for Joe - and looking back, it's always been like that, since he was old enough to have an opinion about things. I love this post! And hooray for making something that will get a ton of wear. I'm making a pair of plaid pants now and my lack of matching prints reminded me of your chevrons here. But the colors look great on Joe! Oh, gosh, that's probably not a good thing! When in doubt, turn everything on the bias! Haha! I love plaid, but whew - I can match stripes but that's about the extent of my skills. Anything with an x and y axis and I'm screwed. Inder, this is just adorable! I love his enthusiasm and love that despite you not loving the fabric, you made it for him anyway. And look how happy you made him! Love. Thanks! The fabric is not what I would have chosen, but it is totally brilliant for Joe and I love that he was drawn to such a loud and awesome print! And these days, I am just too happy to make something for Joe that I know he will love and wear, because when I make what I think he would like, it usually doesn't work anymore. Rosie had a massive fit when I made her wear the O+S Ice cream top I made for her. she didn't like how the seam connecting the yoke to the bodice felt. But, like with many things, if I make her wear it a few times, then she'll decide that she loves it. She at least tolerated it the entire day... Good thing, I have a second dress in the same pattern made for her that she's wearing to school tomorrow! And, Joe is super cute. And chevrons are cool. It will give that funky vibe my living room is desperate for! Hmm... comment not entirely formed. The afghan that I'm 1/2 way done crocheting in a chevron pattern - that is what will help my living room. If I ever finish it that is. Oh, chevron afghans are a whole different matter in my world! I looooove those! I just don't like matching chevrons, and the print kind of hurts my eyes. Sometimes your approach with Rosie works with Joe, but sometimes it doesn't. I have several items he has steadfastedly refused to wear from the beginning and never worn. When I made him put them on, he would just cry and take them off. He's not one to quickly forget an issue, either. He's a grudge-holder! Haha.